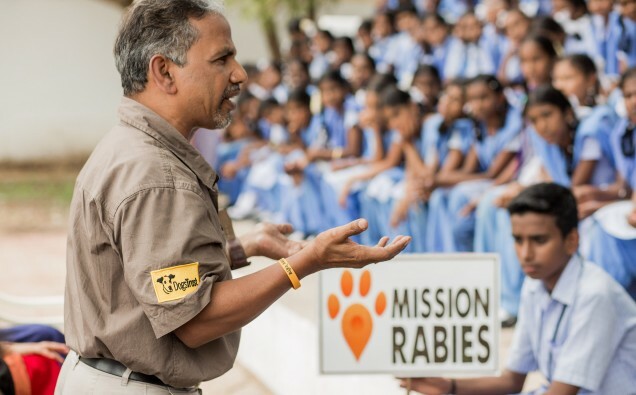 In December 2018, Mission Rabies celebrated the education of one million children in India. The milestone is a result of its work delivering rabies education lessons over the last five years, empowering children in local schools and community groups with the knowledge of how to protect themselves from rabies and what actions to take if bitten by a potentially rabid dog. In 2018, no rabies-related human deaths have been recorded in Goa or Ranchi, Mission Rabies’ two Indian project sites, as a result of Mission Rabies’ focused vaccination and education campaigns. India was the first country that Mission Rabies started working in, beginning with a 14-city canine vaccination drive in 2013. Following a successful pilot, Mission Rabies began to focus on making Goa rabies-free as a model for other State Governments to follow. The project has now become the largest systematic mass dog vaccination and community education campaign to have ever been conducted in India. Education has become a key cornerstone of the project. The charity has now worked in 1,390 schools across Goa and led workshops for hundreds of community groups to ensure as many of the people at risk from rabies have the knowledge to protect themselves from this deadly disease. The lessons often take the form of creative role playing performed by Mission Rabies staff and interactive participation from children to help them learn the actions they should take to stay safe from rabies. The milestone was reached following an intensive month-long mass vaccination and education campaign in the Bardez region of Goa in October 2018. During the four weeks, the teams vaccinated over 12,000 dogs and reached more than 24,000 children in schools all over the state with their life-saving lessons. The Mission Rabies education teams will continue to visit schools until the end of the year to ensure all communities in Goa have the knowledge they need to protect themselves from rabies. This milestone also follows the success of Mission Rabies’ education projects in Malawi, which celebrated the education of one million children back in April 2018. To date, Mission Rabies have now educated 2,337,980 children about the risks of rabies across all their global projects. The education and vaccination statistics from all rabies projects are recorded on the Mission Rabies app, a bespoke tool that utilises smartphone technology to support the charity’s work and ensure the campaigns are effective and measurable.